I pulled my tired, reluctant body out of bed first thing this morning for Black Friday. No, I didn't go shop. I dropped my daughter off at work. Retail. Poor baby. She does well with craziness. Me? Not so much. I'm shopping from home today. For anyone else shopping from home, I have a Black Friday special going on! For each book sold through my website store today, November 28, 2008, I will donate $1.00 to Books for Boots [www.booksforboots.org]. Along with each book will be a $1.00 gift certificate for any future purchase from my store. Use it yourself or pass it along to a friend. All books also come with a signed bookmark -- if you want one signed for a friend, also, let me know while you're ordering. My newest book is still currently at preorder price since I've been unable to do the intended 'grand opening' promo for its release, so you get preorder price, a $1.00 gift certificate, and the donation goes to help family members of injured service members visit them in military hospitals. For every 5 books sold, I'll also send along a book for the service members to help fill their recovery time. Happy Shopping! 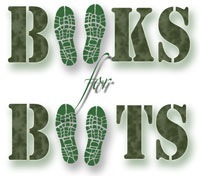 While you're at http://www.BooksforBoots.org, check out the other participating authors. Books make great Christmas gifts!